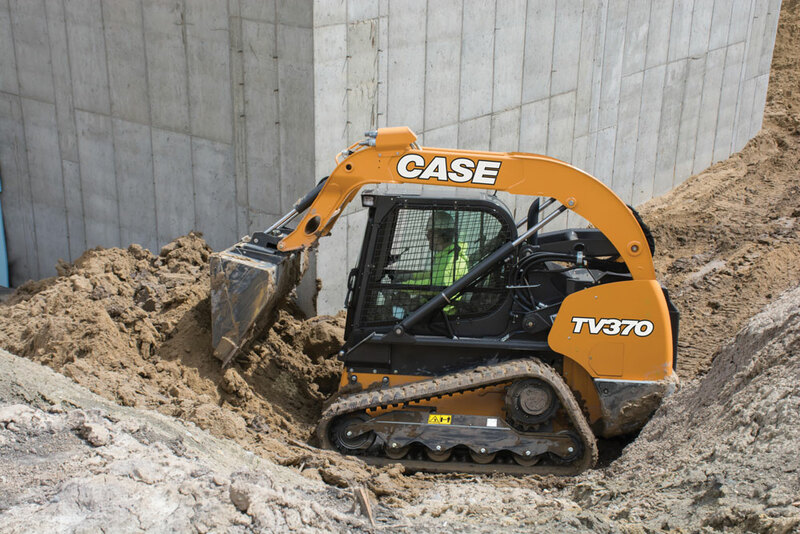 The Case compact track loader lineup — manufactured in Wichita, Kan. — includes five models: the TR270 (radial), TR310 (radial), TR340 (radial), TV370 (vertical) and TV380 (vertical). According to Case, the new models feature best-in-class torque, breakout force and standard auxiliary hydraulic flow (depending on model), as well as one of the industry’s widest cabs with 360-degree visibility. Highlights of the product line include the TR340, which weighs 10,000 lbs with a rated operating capacity (ROC) of 3,400 lbs and a bucket breakout force of 8,700 lbs, and the TV380, which weighs 10,550 lbs, provides 8,776 lbs of bucket breakout force and an ROC of 3,800 lbs. Both machines are rated at 90 gross hp, produce 282 ft-lbs of torque and feature increased hydraulic flow rates (standard — 24.2 gpm; high-flow — 37.6 gpm). The TR340 and TV380 offer an EZ-EH (electro-hydraulic) setup menu with nine adjustable speed and control sensitivity settings that can be adjusted effortlessly as applications change. This allows the operator to match controls to their preference for comfort and greater productivity. A single rocker switch alternates between the Case H operating pattern and ISO pattern controls for operators who are comfortable with one style or the other. New operator handles with industry-exclusive detents improve controllability and feathering by providing greater responsiveness to the actions/movement of the machine. The TV370 is a new 74-hp machine that combines a maintenance-free Tier 4 Final solution with the strength and reach of a large-frame track loader. The TV370 provides a 3,700-lb rated operating capacity and a vertical-lift design that makes it ideal for loading trucks and lifting and placing heavier palletized materials. The TV370 is ideally suited for landscaping, utility, agricultural and rental applications where operators value lift capacity and strength, but may not require higher horsepower to run high-volume production attachments. The machine provides excellent auxiliary hydraulics for traditional attachment use in standard (24.2 gpm at 100 percent efficiency) and optional high-flow (37.6 gpm at 100 percent efficiency) hydraulic setups. All Case compact track loaders feature dozer-style undercarriages designed for stability on steep slopes and performance in muddy and sandy terrain. The rigid track frame features fewer moving parts than suspension track systems, making it more durable and easier to maintain. The cab-forward design, along with the industry’s lowest entry threshold and sloped rear hood, provides visibility with excellent site lines, says Case. Ultra-narrow wire side screens, side lighting and a skylight further improve visibility. Easy access to the engine, filters and fill points simplifies maintenance on Case compact track loaders, with all daily service points and filters located at the rear of the machine for quick access. Easy-tilt cabs provide convenient entry to the drivetrain compartment, and hydraulic quick-couplers allow operators to quickly change attachments from the comfort of the cab. For more on Case, roll through this link.